The venture is funded by Seattle billionaire Paul Allen, who’s willing to gamble on risky projects with the potential for breakthrough results. Later this month, a University of Washington researcher will heave a half-million dollars’ worth of robotic sensors into the frigid waters off Antarctica — and hope for the best. The goal is to answer one of the biggest questions in climate science: How much and how quickly will sea level rise due to melting of Antarctic ice sheets? But the uncertain odds of success made the project a longshot for federal research grants. Instead, the expedition is being bankrolled by Seattle billionaire Paul Allen, who has built a reputation for funding risky research with the potential for major impact. 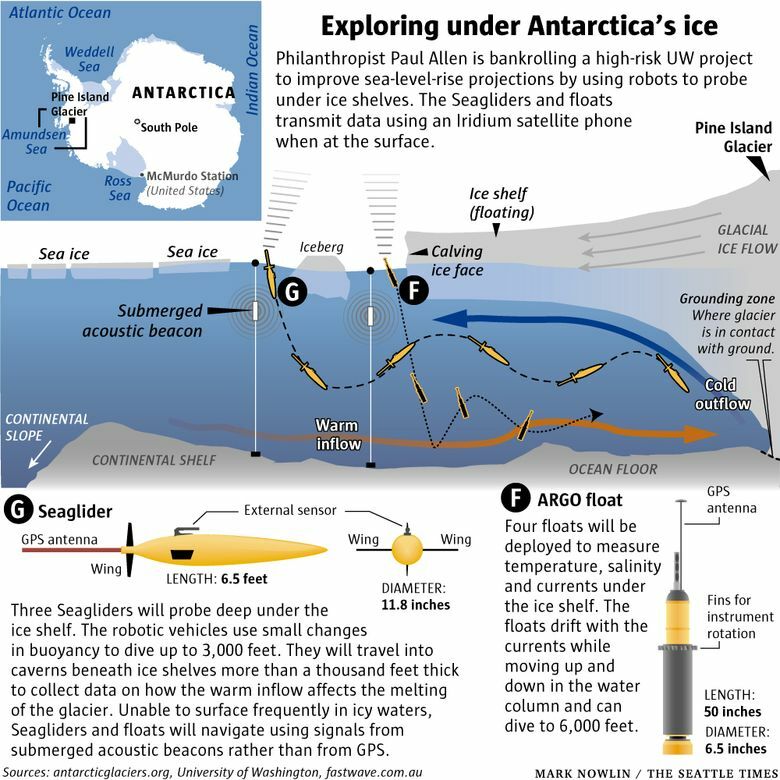 Paul G. Allen Philanthropies put up $1.8 million for the Antarctic field test to see if the robots can navigate the treacherous interface where ice shelves and ocean meet, gather data, and transmit it back to Seattle. Current projections of global sea-level rise by 2100 vary widely — from 1 foot to almost 7 feet — largely because scientists can’t predict the fate of the massive ice sheets that cover Antarctica and Greenland. West Antarctica alone holds enough ice to raise sea levels worldwide nearly 10 feet. The glaciers that cover Antarctica are buttressed by floating ice shelves up to a third of a mile thick. If global warming causes the shelves to collapse or melt, the glaciers could flow more rapidly into the ocean and accelerate sea-level rise. There’s not much evidence of surface melting, so scientists suspect warm ocean currents are eating away at the ice shelf from below. Man-made warming doesn’t seem to be a big factor yet, but is expected to increase the melting in the future, Christianson explained. To understand the forces at work, scientists need to measure temperatures, salinity and currents under the shelf — a place that’s pitch dark, almost impossible to get to, and riddled with caverns, cracks and jagged ridges. The only measurements so far have come from a handful of holes drilled through the ice and several forays by British unmanned submarines. Both approaches are laborious and costly. One of the multimillion-dollar subs dispatched under the ice never returned. 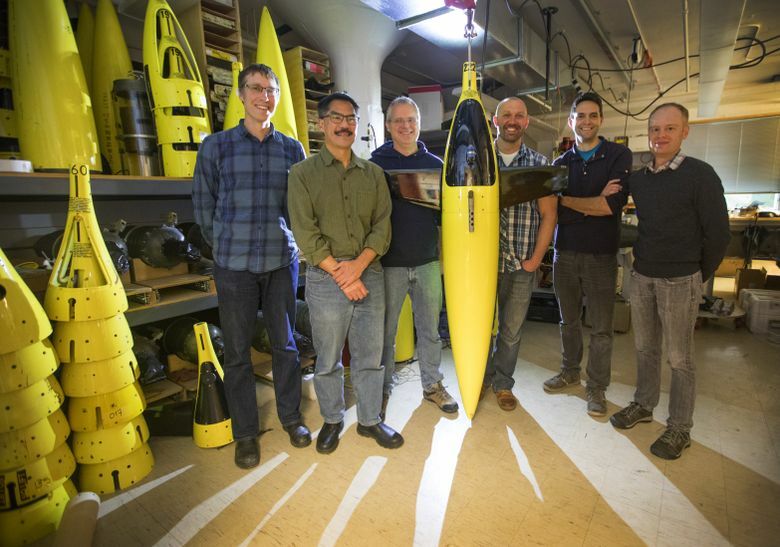 The UW’s experimental armada will include two types of bots: ARGO floats that drift with the currents; and Seagliders, torpedo-shaped drones that propel themselves through the water by slight shifts in buoyancy. Seagliders were invented at the UW in the 1990s. Licensing the technology to commercial manufacturers has since earned the university about $2 million, most of which is reinvested in related research. Seagliders and ARGO floats are used in open oceans all around the world, but operating under ice is much tougher, Lee said. The probes aren’t able to surface and make contact with satellites that help them navigate and transmit data. 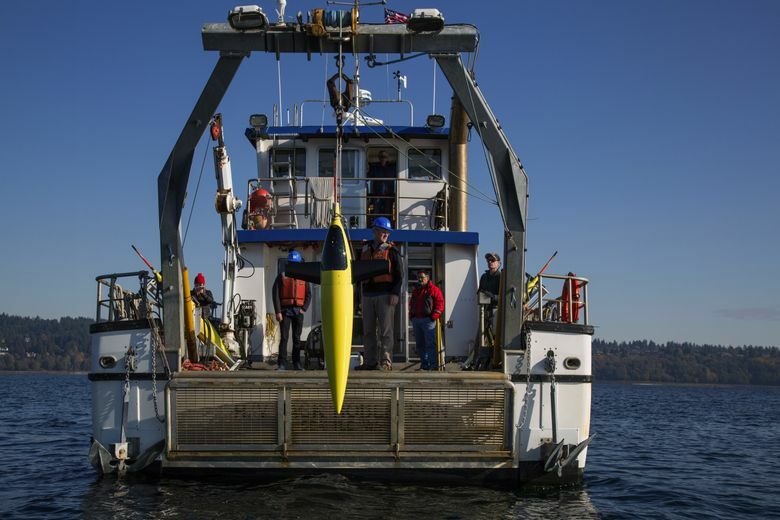 The UW team tested the instruments in Puget Sound before crating them up for shipment to New Zealand, where they’ll be loaded onto the South Korean icebreaker R.V. Araon. 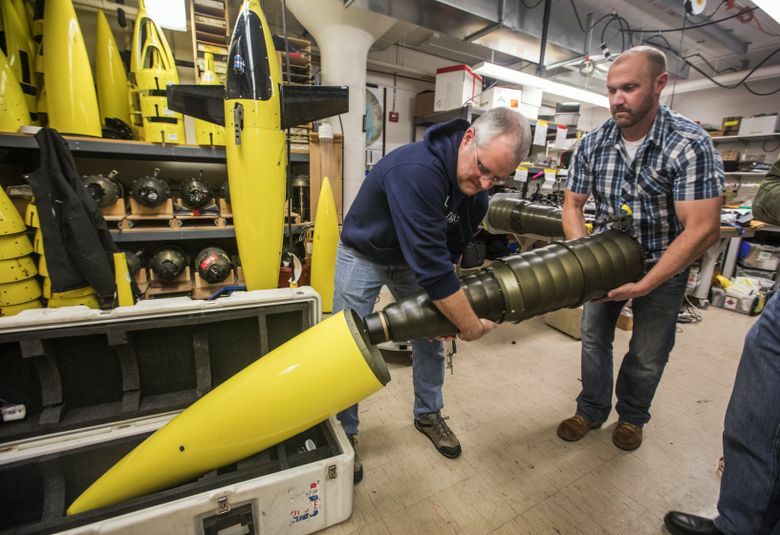 UW oceanographer Jason Gobat and Pierre Dutrieux of Lamont-Doherty Earth Observatory at Columbia University will deploy the drones from the ship during its 50-day polar science mission. The four Argo floats will be swept under the ice and won’t be able to communicate with the scientists in Seattle until — and if — currents flush them back into open water. 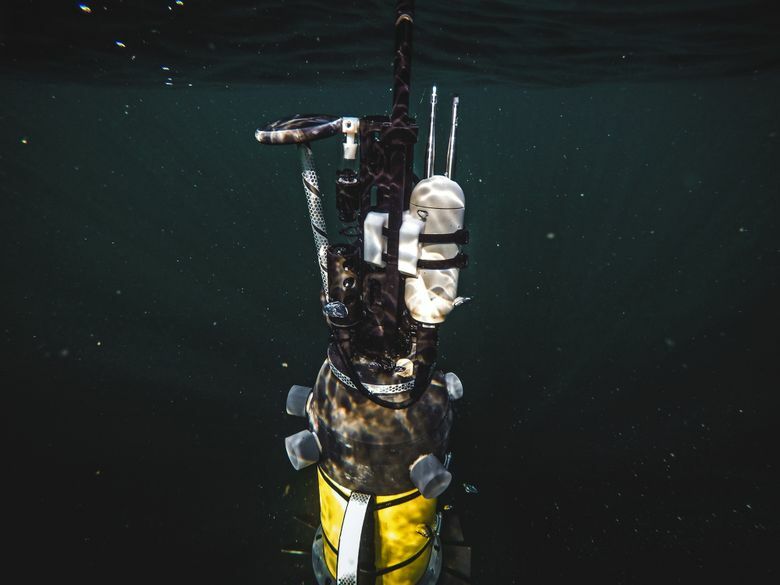 The three Seagliders are programmed to initially venture short distances under the edge of the ice, then back out to transmit data and receive instructions. When the Southern Hemisphere winter descends in June and the sea freezes, the Seagliders will be on their own, exploring and collecting data up to several miles under the ice shelf. The instruments have enough battery power to last at least a year, but the UW team won’t know their fate until the Antarctic spring. At a cost of about $30,000 per float and $100,000 per Seaglider, the loss of the probes wouldn’t be catastrophic — as long as they were able to send back at least some useful data, Lee said. Ted Maksym, a sea-ice researcher at Woods Hole Oceanographic Institution, said the project is perfect for a philanthropist like Microsoft co-founder Allen, who’s willing to gamble on cutting-edge science.